A good guideline for determining the maximum number of fish to keep in any size tank is one inch of fish per one gallon of water. In order to create a healthy environment for your fish, add only 10 inches of fish (so roughly two or three) and wait a month. Doing this creates the nitrogen cycle, a process that establishes helpful bacteria in the water and removes ammonia, which, in abundance, will kill your fish. Test the levels of ammonia and nitrite daily; once they return to zero, which means they are balancing themselves out, you can add more fish. 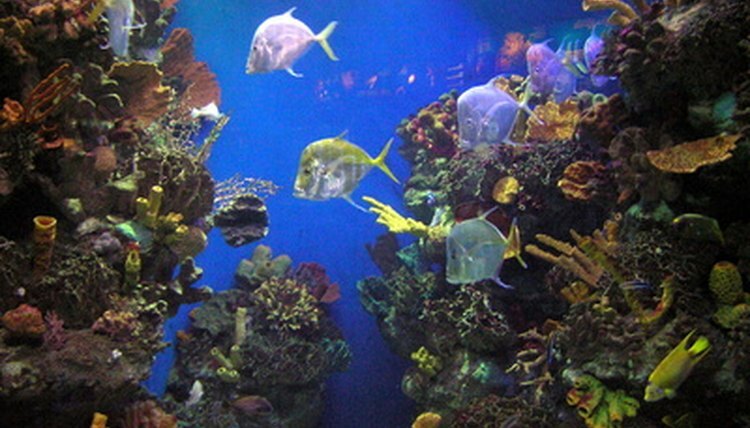 The one-inch-per-gallon rule still applies, so be sure that you do not exceed 55 inches of fish in a 55-gallon tank. This roughly equates to four or five bottom-dwelling fish along with a couple algae eaters. For the happiest aquarium, buy community fish, those that coexist peacefully with other fish, such as rainbow fish, tetras or female bettas. Andrew Walker is an English major at the University of Central Florida following the technical communications track. He has worked on and with technology for most of his life, both in retail sales and professionally as an intern for the banking software company Fidelity National Informational Services.